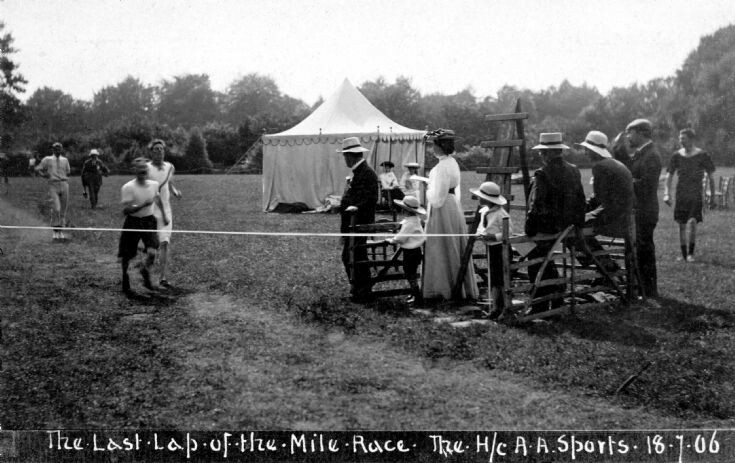 The longest race at the AA Sports Day in Handcross was for one mile, and the picture shows the exciting finish in July 1906. John “Jack” Dancey (20 yo) of the Horsham Road, Handcross is named as one of the runners, but it is not clear which one. At the end of the tape are the Rector’s wife, Mrs Penelope Boyd, and their two sons James Boyd (3 yo) and William Boyd (5 yo). Sitting in the shade of the tent are Mrs Funnell and Miss Mary Leppard (14 yo). In the far distance wearing a white hat is landscape gardener, George Heather, carrying a mallet presumably after driving in some posts. Oh wow. Mrs Funnell is my husband's great-grandmother.